The Sheriff's Department is teaming up with the National Highway Traffic Safety Administration (NHTSA) and the California Office of Traffic Safety (OTS) to keep impaired drivers off San Diego's roadways on Super Bowl Sunday. Watch for increased DUI patrols by deputies across the county beginning on Sunday, February 4th at 3:00 p.m. and lasting through 5:00 a.m. the following day. Impaired driving doesn't just refer to alcohol. It also means marijuana and prescription drugs. "If you are caught driving under the influence of drugs or alcohol, you will go to jail," said Sheriff Bill Gore. "Crashes caused by impaired driving are 100 percent preventable." In 2017, 1,225 people were arrested for DUI by Sheriff's Deputies. Funding for the Super Bowl DUI enforcement program is from the California Office of Traffic Safety (OTS) through the National Highway Traffic Safety Administration (NHTSA). 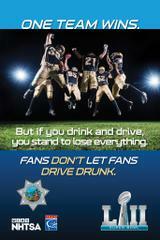 Remember: Fans Don't Let Fans Drive Drunk.